Abstract: Control Theory and other frameworks for understanding self-regulation suggest that monitoring goal progress is a crucial process that intervenes between setting and attaining a goal, and helps to ensure that goals are translated into action. However, the impact of progress monitoring interventions on rates of behavioral performance and goal attainment has yet to be quantified. A systematic literature search identified 138 studies (N = 19,951) that randomly allocated participants to an intervention designed to promote monitoring of goal progress versus a control condition. All studies reported the effects of the treatment on (a) the frequency of progress monitoring and (b) subsequent goal attainment. A random effects model revealed that, on average, interventions were successful at increasing the frequency of monitoring goal progress (d+ = 1.98, 95% CI: 1.71 to 2.24) and promoted goal attainment (d+ = 0.40, 95% CI: 0.32 to 0.48). Furthermore, changes in the frequency of progress monitoring mediated the effect of the interventions on goal attainment. Moderation tests revealed that progress monitoring had larger effects on goal attainment when the outcomes were reported or made public, and when the information was physically recorded. 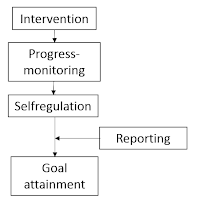 Taken together, the findings suggest that monitoring goal progress is an effective self-regulation strategy, and that interventions that increase the frequency of progress monitoring are likely to promote behavior change.